A&E's The Last Days of the Civil War is a jam-packed, two-disc set gathering five exceptional documentaries from The History Channel. Highlighted by a recently premiered original that chronicles the final month of the war, three of the historical principals in the conflict between North and South get their own respective tributes, while The Tragedy Of Cold Harbor, a lengthy, nearly year-long battle that marked the war's turning point, gets a stirring re-telling via detailed reenactments. Based on respected historian Jay Winik's acclaimed literary tome, this 90-minute overview covers four weeks in US history filled with pivotal battles, a highly anticipated surrender that ended in most bittersweet fashion, and the tragic loss of a leader much too soon. Narrated by actor Powers Boothe with contributions from Winik and fellow historians including Donald L. Miller and Gary W. Gallagher, the program gets a little too artsy with quick cuts, trying to cram too much into a short running time. But the strength of the participants' ruminations combined with imaginative blends of period photographs and well-staged recreations make it worth seeing. Abraham Lincoln: Preserving the Union (01h:29m:20s): Made in the days before Biography became bitten by the rapid-fire pacing of shows like Behind the Music (ill-suited for programs of this sort, if you ask me), this patiently paced, well written expanded edition of an A&E favorite paints a vivid, definitive portrait of the country's 16th president. In addition to the usually noted high points of his life (his political debates with Stephen Douglas; his courageous stance on slavery that led to the Emancipation Proclamation; the classic speech at Gettysburg), Preserving gives great insight into many aspects of his life not usually covered, including his humble Kentucky beginnings, the tragic loss of his mother at age eight, his special relationship with stepmother Sarah, a talent for storytelling that brought him out of his shell, and his marriage to socialite Mary Todd, a stormy union plagued by bouts of moodiness on the groom's part and financial disagreements. Jefferson Davis—"The Traitor" President (43m:58s): Somewhat of a forgotten figure in these days and times, this History Channel installment of Civil War Journal reveals many fascinating facts about the Confederate leader, including his devil-may-care days as a young West Point attendee, his surprising entry into politics, and his unlikely role in the designing of the Capitol dome. Surprisingly involving until the very end, capped with a fascinating coda covering his incarceration following the Civil War's conclusion. The Tragedy at Cold Harbor (45m:22s) : One of the war's most devastating battles with hundreds of casualties forms the focus of this installment of Civil War Combat, another History Channel offering. Focusing on lesser-known heroes, such as Elisha Kellogg, and filled with dramatic (and at times, surprisingly violent) recreations of the fighting, none of the accompanying documentaries on this two-disc compilation came close in bringing home the horror, heartbreak, and tragedy of war better than this. Biography: Robert E. Lee (42:41): Another stellar episode of the acclaimed series chronicles the Confederate Army's chief general whose military career hit the ground running after his second place finishing at the US Military Academy in 1829. Save for his contributions during the battle between North and South, I had no idea just what an extensive resume he possessed with standards so high that it made life difficult for his seven children, particularly his daughters (whose suitors were very intimidated by the old man's reputation). Image Transfer Review: April 1865 is by far the best of the five programs, given its recent premiere and classy but nonanamorphic letterboxed presentation. As for the remainder of the documentaries, well, let me put it this way: Produced in the mid-to-late '90s, specialized television like this was not produced with the high-definition crowd in mind. So expect some occasional dropouts and similar videotape anomalies that are common with shows like these when moved over to the digital format. The Month that Saved America merits a strong "A" caliber grade, followed by a high "B" for Cold Harbor, with the older Civil War Journal offerings ranging from "B-" to "C+" (the latter being for Abraham Lincoln whose washed out, color-challenged presentation makes it appear taken from a second generation source). Audio Transfer Review: Like the visuals, April 1865 earns the blue ribbon of merit for a very wide 2.0 stereo presentation that has the presence of a Dolby Digital mix and perfect equalization. Although the other selections pale in comparison (with the oldest presentations sounding a little flat in the high end with a touch too much bass), these weren't produced with the high-caliber speaker crowd in mind. Extras Review: Five documentaries and you want extras? In such cases where practically everything that need be said on a topic like this has been covered, extras might be a bit on the repetitive side. However, as one who loves behind-the-scenes material, I would have gladly sat through a featurette or "making-of," detailing just how much work goes into something as simplistic as videotaping vintage pictures and inserting a historian's comment here, etc. So much more goes into making specials like these, so just a thought for A&E's personnel. The text for President Lincoln's historic Gettysburg Address is provided, and that's the sole bonus. 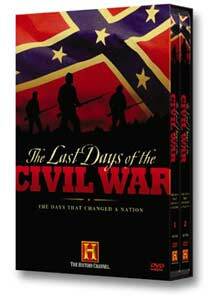 The Last Days of the Civil War is a fine collection of riveting, educational documentaries that will please history lovers immensely (particularly the program on Abraham Lincoln, which is one of the series' very best). Despite spotty technical issues, the quality of the material overrides such misgivings.